Demographers and other analysts have yet to reach a consensus about how we define post-WWII generations – regarding both naming the generations and defining the age spans that each generation covers. Yes, there is general agreement that the oldest of these generations are called baby boomers and that they were born between the mid-1940s and mid-1960s. Some choose 1946 to 1964 to correspond with the period of increasing birth rates, but some choose 1945 to 1964 to produce a cohort that better lines up with typical age groups published in census and survey data, say 15-34 year olds in the 1980 census. The generations that come after baby boomers are much less consistently defined. The next youngest was first called the baby bust to identify cohorts born during the period in which birth rates and the number of births were rapidly declining. When this generation became teenagers and young adults, it was discovered that the baby bust would likely behave quite differently from the baby boomers that preceded them in the age structure. Pundits on Madison Avenue and in the media rebranded it Generation X. Some analysts claim that this generation arrived in the early 1960s (perhaps as early as 1961) and that its youngest members were born in 1981 or 1982. Others chose sometime in the mid-1970s as the date at which the youngest of the baby bust came into this world. The next youngest generation, called Generation Y by uncreative verbivores, and millennials by a more hip crowd, is even less consistently defined by starting and stopping birth years. Called echo boomers by many demographers, birth years can be anywhere from the mid-1970s when the oldest were born to the mid-2000s when the youngest were. The problem with these differing birth year definitions is that either the generations overlap or they cover different age-spans, making data analyses very complicated. 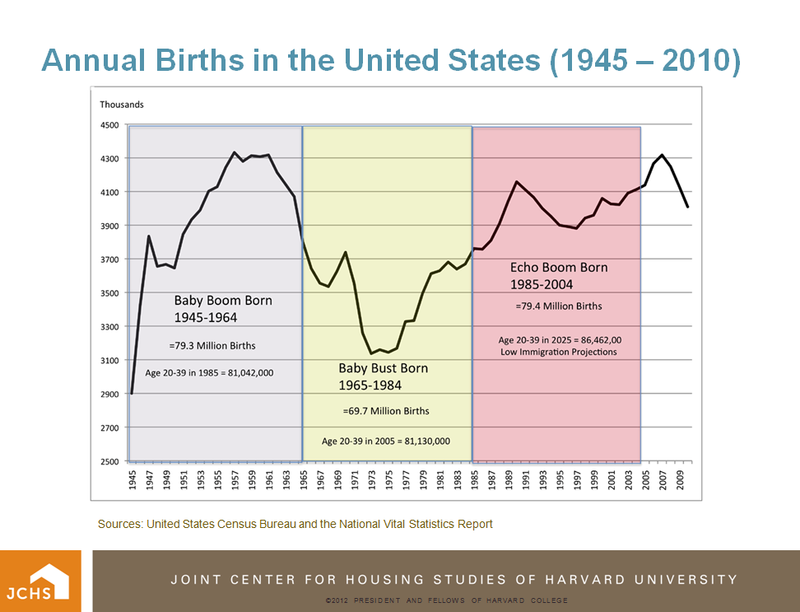 For much of the research done at the Joint Center for Housing Studies, we define the baby boom as the cohort born 1945 to 1964, the baby bust from 1965 to 1984, and the echo boom from 1985 to 2004. The primary reason for choosing these dates is to have the three generations cover equal 20-year age spans, and have age ranges that line up with typically published age groups. And, not coincidently, these chosen years line up nicely with levels of annual births (see figure below). Early baby boom cohorts quickly move to annual birth numbers in the 3.7 million range, and the youngest baby boom members are from a cohort when births returned to approximately this number. The baby bust ends when annual births returned to these same levels. The echo boom begins and ends with numbers consistently above 3.7 million. Though it is the number of births used to fix the year of birth of the oldest and youngest members of each generation, the size of each generation moving forward in time is also determined by immigration. Thus, the baby boom generation arose from approximately 79.3 million births over the 1945 to 1964 period, but by 1985, when the generation was age 20-39, it was over 80 million in number, having been inflated by immigration that more than offset Vietnam War era baby boom deaths. The baby bust generation contained only 69.7 million persons born in the United States, but high immigration flows from persons born abroad resulted in a cohort size that just surpassed the size of the baby boom when each was age 20-39. 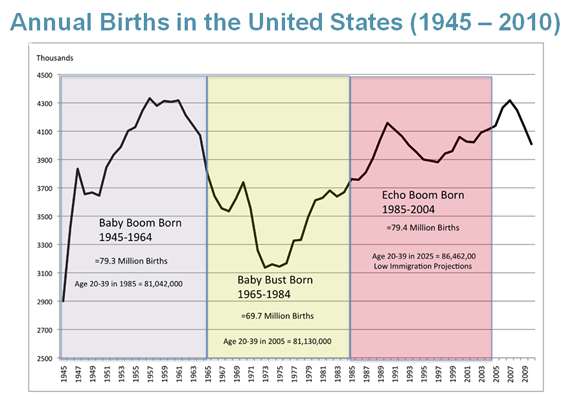 Finally, while the echo boom has about the same number of U.S. births for its base as the baby boom, it will surely further surpass the size of baby boomers as young adults. The current set of low immigration household projections from the Joint Center are based on population projections that estimate 86.5 million persons age 20-39 year old in 2025. It is not uncommon to hear the claim that the baby boom is being succeeded by a much smaller cohort. But this is simply no longer true if the comparison is among similar 20-year deep generations. Immigration has backfilled the birth deficit that created the baby bust and it is now larger than the baby boom. The 2010 decennial census counted 81.5 million baby boomers and 82.1 million baby busters. But perhaps the most relevant comparison generation to aging baby boomers should be the echo boom. It is this generation that will largely be buying baby boomer housing and making significant contributions to their Social Security and Medicare benefits when all boomers are over the age of 65. After 2030, when the ever-smaller cohort of surviving baby boomers are age 65-84, the echo boom will be age 25-44, and far fewer from this still expanding generation will have died. I wish I had access to this sort of clear and concise analysis in grad school. I recommend that Michael White put this post on his syllabus in his (wonderful, amazing) Principles of Population course. What this leaves out, however, is how much longer the baby boomers will live - or to put it another way how long I'll be paying for your Social Security and Medicare. Yes, we are much better off than almost every other wealthy country, as Japan and Europe will face daunting dependency ratios going forward (although with less children to pay for subsidizing pensions and medical care for the elderly may be easier). But even with near parity in cohort size won't today's "baby busters" (my generation) end up paying more and more of our taxes to supporting the long living boomers? a) Many look at the projected rise in the Old Age Dependency Ratio (persons age 65+ per 100 persons age 20-64) from about 20 in 2010 to about 35 in 2030 as the critical metric raising alarm. However, remember that a Ratio of 20 is presently producing a surplus in the balance between Social Security taxes to benefits, so the more accurate metric is the ratio of elderly to 100 working age population that is necessary to produce an exact balance in the ratio of Social Security tax inflows to benefit outflows. That “Old Age Social Security Dependency Ratio” is historically and currently higher and not rising as rapidly. b) More age 65+ are working, and their labor force participation rates are projected to increase. And, since the youngest baby boomers are only age 47, the youngest and largest half of the baby boom generation will continue to pay into Social Security for the next 20-30 years. c) Wealth flows are in the opposite direction – from the 65+ to the 20-64 age group, and assets likely to flow to your generation over the next 20-30 years will be much larger than assets that flowed to older baby boomers from their parents. Make sure you invest it wisely for your own benefit in old age, and to perhaps pass on what you don’t need to your own children. d) Congress has uncharacteristically already looked long into the future on this matter and has made many adjustments to Social Security in anticipation of baby boomer retirement. Other adjustments can be made without significantly raising payroll taxes on your generation to meet future shortfalls that are decades out, including conversion of estate tax revenues to dedicated Social Security payments, and raising the maximum taxable Social Security wage base. e) Maybe, as more baby boomers retire they will release jobs that ultimately trickle down to 20-64 year olds who are not working. Movement to a 4-day workweek would accomplish the same thing before retirement. The growing Medicare burden is, of course, a whole other kettle of fish. Here, serious changes need to be made in the way health care is delivered. Social Security reform and Medicare reform should not even be mentioned in the same breath. Defining the generations purely by demographic bulges and busts (like the Census) misses key cultural indicators that a very different set of young people has come along--the same mistake made when commentators set Millennial birth boundaries starting in the late-70s. People born in the early sixties (Gen X) had a very different coming of age experience than those born in the mid to late 1950s. Your chart above shows that the "boom" years ended in 1961 anyway. So why call 1961 to 1964 the "Boom(er)" years? Doing a thesis on Attraction & Retention Factors Amongst Generation Y Employees, this article helped out a lot! much thanks.. I'm glad I found this study. This answered so many questions. I was wondering why generation Y (or millennial)generational years were vaguley discribed as "somewhere between the early 1980's to the early 2000's..." I was also wondering how this data was gathered and determined. Although the consensus is determined by the average amount of births over a span of a 20 year period, Anonymous makes a point, It is so important to determine cultural indicators as well as coming of age experiences due to the fact that those whom have come of age in the 80's & 90's would not have had a similar experience as someone coming up in the millennium. Thank the gods I am Gen X!